This indicator is no longer being updated. The latest data are available in the following indicators - OD07. The indicator shows the quantity and structure of waste deposited at lawfully operating landfills in Slovenia. It outlines the quantity and structure of non-hazardous municipal waste deposited in public infrastructure landfills as well as the quantity and structure of waste deposited in landfills which are operated by the industry. Waste is defined as any substance or item which is discarded, is going to be discarded or must be discarded by its owner. Each type of waste is given as a six-digit classification number, i.e. a code from the classification list. The waste classification list is published in the Annex to the Decree on waste management (Official Gazette of the Republic of Slovenia, nos. 34/08). Hazardous waste, which is marked by an asterisk next to the classification number, bears one or more characteristics defined in the framework waste legislation. Nnon-hazardous waste is, in compliance with legislation, defined as any waste not categorised as hazardous waste. Inert waste, as defined in the regulation on the landfill of waste, is waste which is not undergoing significant physical, chemical or biological modifications, will not decompose, is not flammable, biodegradable or otherwise chemically or physically reactive, does not present a health risk and does not affect other substances if it comes in contact with in such a manner which may increase the burden on the environment. Landfilling, i.e. the process of waste disposal, is the final treatment of waste which cannot be recovered or otherwise utilized. Depending on its type, waste is deposited to the appropriate landfills. In compliance with the regulation on landfilling, landfills are designated as: hazardous waste landfills, non-hazardous waste landfills and inert waste landfills. A landfill means a waste disposal site for the deposit of the waste onto or into land (i.e. underground), including internal waste disposal sites (i.e. landfill where a producer of waste is carrying out its own waste disposal at the place of production for more than three years before depositing the waste for further treatment in compliance with procedures outlined in the waste management regulation), and a permanent site (i.e. more than one year) which is used for temporary storage of waste. landfill of municipal waste (waste with the classification numbers 15 and 20 on the waste classification list) falls within the competence of municipal public services and is permitted in non-hazardous waste landfills. These landfills represent municipal public service facilities or public infrastructure facilities. Non-municipal waste may be landfilled by legal persons or independent entrepreneurs. The operators are responsible for active or inactive landfills or underground storage sites which they manage in compliance with regulations. Reduction of environmental impacts related to the landfill of waste (greenhouse gas emissions, leachate). Official records of the Environmental Agency of the Republic of Slovenia show that at the end of 2006 there were 83 active or inactive landfills in Slovenia. 60 of those were public infrastructure landfills and 23 were industrial waste landfills. At 24 public infrastructure landfills, the implementation of the uncompleted works plan is anticipated as part of the deactivation phase in compliance with the legislation on waste landfilling. 28 landfills are in the phase of adapting to the technical requirements determined in the regulation on the landfill of waste. The remaining 8 landfills have been constructed in compliance with the requirements of the legislation on the landfill of waste. Data by the Environmental Agency of the Republic of Slovenia indicate that in 2006, waste was deposited in 44 public infrastructure landfills as part of the programme of adaptation, deposition in new landfills and within the framework of the uncompleted works plan. At the remaining landfills, deactivation works were performed and no waste was deposited. 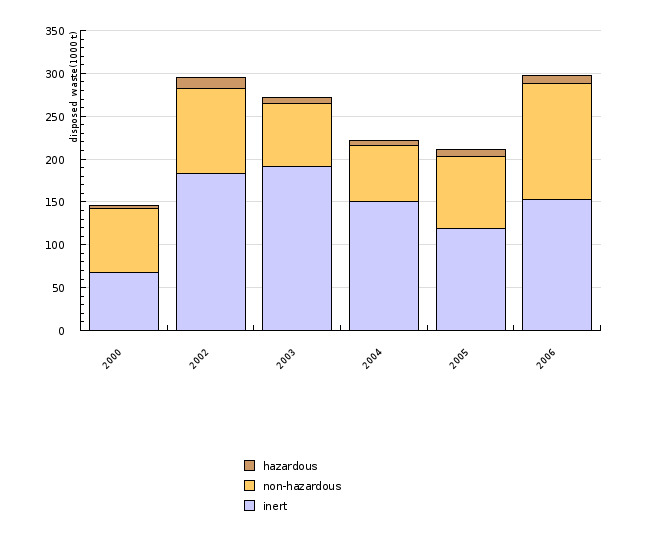 The comparison of data by the Environmental Agency of the Republic of Slovenia on the quantities of waste deposited in public infrastructure landfills indicates that between 2000 and 2002, the amount of waste was reduced by about 14% (approximately 822,000 tonnes down from approximately 956,000 tonnes). Slight fluctuations were detected between 2002 and 2004: in 2003 the quantity increased by approximately 2.7% relative to 2002, while in 2004 it decreased by approximately 1.4% relative to 2002. 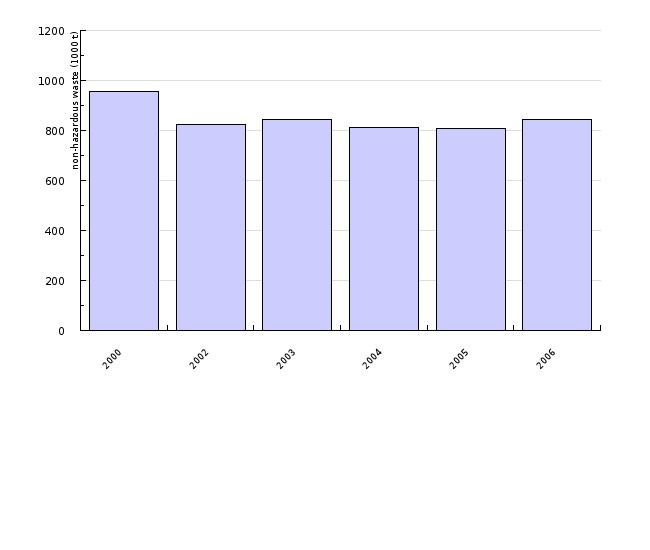 Data for 2005 indicate a 15% reduction of the total landfiled waste relative to the baseline year 2000. Figure OD2-1 reveals that 2006 again witnessed a 4.3% increase in quantities of waste deposited in public infrastructure landfills, i.e. 844,500 tonnes of waste, which is similar to the amount in 2003. According to the data by the Statistical office of the Republic of Slovenia, the quantity of municipal waste increased by approximately 2.4% in 2006 relative to 2005. In addition, there was a 4.2% increase in the quantity of municipal and similar waste collected by public waste management services as compared to 2005. As a consequence, the total quantity of waste deposited in public infrastructure landfills was higher than in 2005. In 2006, 844,500 tonnes of waste were deposited in public infrastructure landfills. 728,300 tonnes of it represented municipal and similar waste while 116,200 tonnes were non-municipal waste. According to the data by the Statistical office of the Republic of Slovenia, the structure of waste in public infrastructure landfills in 2006 was as follows: municipal waste 82.3%, construction waste 4.3%, water treatment waste 3.5%, waste packaging 0.6%, wood recovery and paper production waste 3.3% and other waste 5.9%. 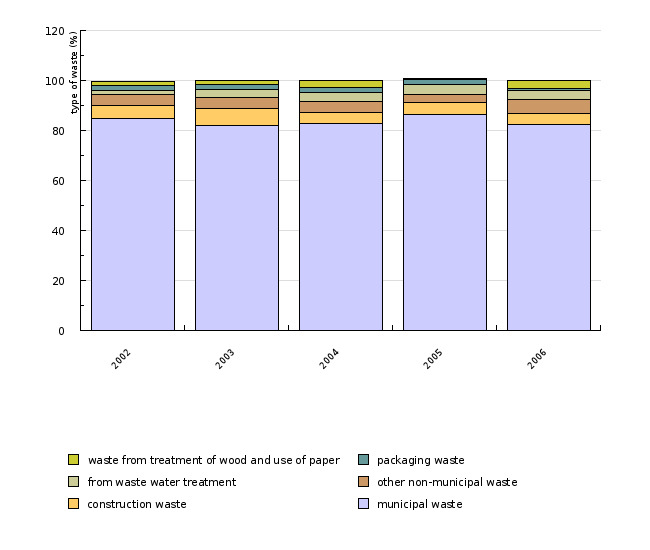 Compared to previous years, the structure of waste did not change much. However, we anticipate that the higher levels of treating waste prior to landfilling will result in an increased percentage of deposited municipal waste. Recovery extracts those fractions of waste which still have some utilization value. The residue following recovery is classified as mixed municipal waste and is removed in compliance with procedure D1 (landfilling). It may thus be assumed that in the upcoming years, the share of mixed municipal waste deposited in landfills will continue to increase relative to the total quantity of deposited waste, while the total quantity of deposited waste will continue to decrease. Based on data on environmental protection taxes, there were 15 active landfills operated by the industry in 2000. By the end of 2006, the number had risen to 19, though waste landfilling did not take place at two of these in 2006. Official records show that in 2000 only 145,000 tonnes of waste were deposited in landfills operated by the industry, while 2002 saw a more than 100% increase in deposited waste (295,400 tonnes). Between 2003 and 2005, the trend of landfilled waste was on the decrease (210,600 tonnes in 2005), while in 2006 the quantity of landfilled industrial waste increased to above the 2003 level. In total, approximately 297,000 tonnes of waste from production activities were landfilled in 2006. These landfills accept inert, non-hazardous and hazardous waste. The annual quantity of non-hazardous waste amounts to approximately 2 – 4.5% of the total landfilled waste in the studied period. Over 50% (up to a maximum of approx. 70% in 2003) of all landfilled waste from production activities is inert waste. The quantities of non-hazardous waste in the studied years vary between approximately 27 and 52% of the total landfilled waste. The Ministry of the Environment and Spatial Planning– Environmental Agency of the Republic of Slovenia has been monitoring the quantity of landfilled waste since 2001. Landfill operators first reported on the quantity of deposited waste in 2000. The data are collected on the basis of the Decree on the waste disposal tax (Official Gazette of the Republic of Slovenia, nos. 70/01, 09/04), the Decree on environmental tax for environmental pollution caused by waste disposal (Official Gazette of the Republic of Slovenia, nos. 129/04, 68/05,2606, 132/06 and 71/07) and the Decree on the landfill of waste ((Official Gazette of the Republic of Slovenia, nos. 32/06 and 98/07). The Decree on the environmental tax stipulates that landfill operators obliged to pay the environmental tax must submit a form containing the data on the types and quantities of landfilled waste in the previous year by March 31 of the current year. The data submitted by individual liable operators are based on their records, which they are obliged to keep in compliance with the regulations on waste management and waste disposal. The data are entered into the Waste Management database. The data on waste disposal have been uniformly collected (one form) and analysed since 2006, thereby complying with the valid legislation governing waste management as well as statistics. Other aspects of waste management (generation, collection and recycling of waste from production and service activities) have been uniformly collected and analysed since 2003.